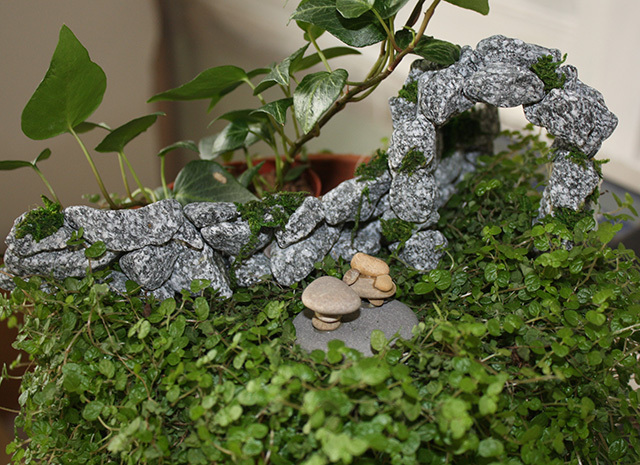 This entry was posted in DIY Projects and tagged canadian fairy houses, DIY fairy garden ideas, fairy garden canada, fairy garden DIY, fairy garden ideas, how to make a fairy house, make a stone fairy house, stone fairy house by Marthe Hook. Bookmark the permalink. I am curious to know exactly why you glue to a zip lock bag and not directly onto the form itself? I use E6000 or GE II silicone on bowling balls and other outdoor art. Holds up great outside! Use e6000 glue it is totally weather proof. I do take my things in for winter. Guess what I made my mom for mother’s day?!?! And big expensive mess. Perhaps this shouldn’t be described as easy? Perhaps if you found fault with your own instructions you could update it all together rather than adding information in the comments where no one will see it in time… I sure hope my mom enjoys excuses and apologies through tears… thanks. Fantastic!!!! I am going to have a go. Thankyou for sharing. Gill. Hi, Essex. What did you use to make the door? HI Christine..the door is made of a small piece of bark. Happy fairy gardening! You have me intrigued. Perhaps a project for spring. Thank you from Calgary! I tried this method and it failed miserably. I checked at 1/2 hour and the stones came apart. Same thing happened at 45 min and again after an hour and 10 min. What are you using, magic fairy glue? HI Jimmy. I admire your patience! I suspect that you are using stones that are to large. 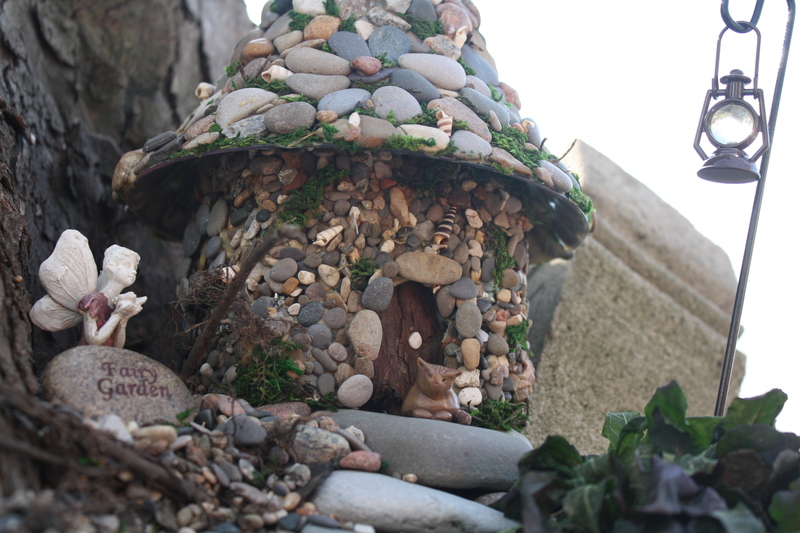 On the Stone Fairy House you can see that the roof and and the bottom of the house are made using VERY different sized stones. 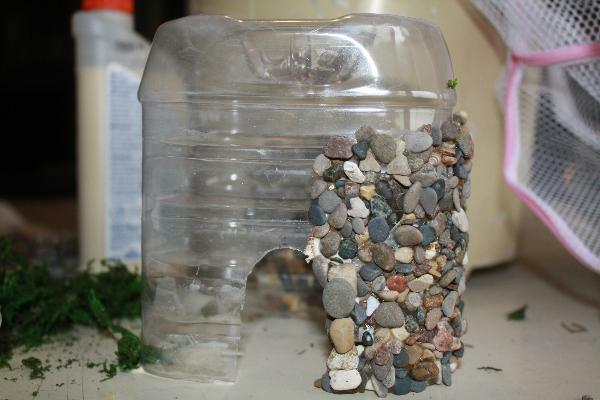 The stones on the bottom are beach gravel and are no larger than 3/8″, with many being quite a bit smaller. On the roof the stones are larger and have been placed one at time leaving each row to dry for a white as I worked my way up the roof worked up the roof. The glue i used on both parts was ordinary white glue. Some cautions on this however. On the roof where the stones are adhered to a hard plastic surface the result is brittle and the stones will crack into section if dropped. I also found over time ..that the white glue would get very brittle when subjected to low or changing temperatures. Not so great for outdoors. The fix for me was this. I redid made the roof using an out door adhesive caulking from the hardware store. 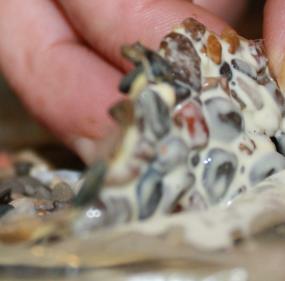 Just to make sure …I glued a bit of burlap fabric ( dollar store, hardware store, or garden center) to the hard plastic surface and then glued the stones on that. Happy Building? Hi April. 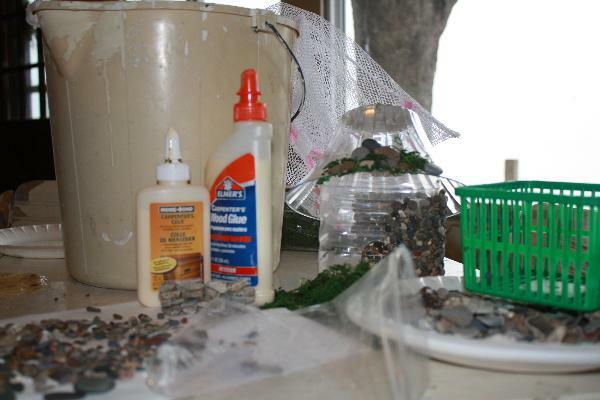 I used a hard plastic salad bowl from a dollar store , However I did find that the gleu and stone had a hard time staying together there when stressed…Try cutting up another platic bottle. A large pop bottle with straight sides . Cut off the top and bottom. Slit the remaining piece down one side. Now make a cone shape side and staple , tape or glue it. maybe all three…lol. And carry on.